On July 28th, 1914 several young Serbian patriots put an operation into motion that would have terrible consequences in the years to come. By the end of that day, Archduke Ferdinand of Austria-Hungary and his wife were dead. The assassination provided the Austro-Hungarian leadership with the excuse they needed to declare war on Serbia. By early August Russia, Germany, France, and Great Britain were also involved in the conflict. At that time everyone thought that the war would end in just a few months. Instead it lasted for four long years, and by the end of it, more that sixteen million soldiers and civilians were dead. These days very few people think about or remember what took place during those four terrible years. We forget too that the seeds for World War II were germinated during World War I. Germany was humiliated and bankrupted by the terms of the Treaty of Versailles, and Adolf Hitler took advantage of German anger and frustration to take power. Though we tend to remember those who died during World War I on November 11th, I think we should also try to understand why the war began in the first place. You will find some wonderful books for young people about World War I on the TTLG website on the World War I feature page. I hope you find something here that interests you. When I was a little girl growing up on the island of Cyprus, I had a record that I listened to over and over again. It was a recording of Vivien Leigh reading some of Beatrix Potter's most well known stories. Soon Mrs. Tiggywinkle, Hunca Munca, Peter Rabbit, and Mrs. Tittlemouse were old friends of mine. Many years later my soon-to-be husband bought me the Complete Tales of Beatrix Potter, and I read the stories to my students in a Washington D.C. public school. Though some of my children had very difficult lives and were quite tough and hardened, they could not resist hearing about the duck who almost got eaten by a fox, and about the bad rabbit who almost got turned into rabbit pie. They would pretend that they were not listening as I read out loud, but I knew they were. Some years later I began to read Beatrix Potter's stories to my own daughter, and when we got a pet duck, she was called Jemima. I am sorry to say that our Jemima did not have much more sense than the original did. However she did give us many delicious eggs. 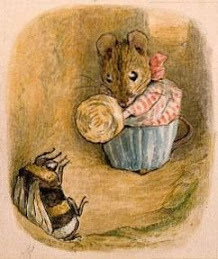 Today, on Beatrix Potter's birthday, I give thanks for Beatrix's beautiful illustrations and her memorable characters. I give thanks that Beatrix found the courage to defy her parents, and that she went ahead and wrote her timeless stories. You can find a profile about Beatrix on the TTLG website and there is also a collection of her books, and books about her, on the Beatrix Potter feature. Before I moved to the U.S some eighteen years ago, (was it really that long ago?) I did not know much about Amelia Earhart. Then I worked in a school for a while, and began exploring the world of children's literature. I discovered that many children (especially girls) are fascinated by Amelia's story. As I started reading non-fiction titles about Amelia, I came to realize that flying was only one of the many things that she did with her time.She gave speeches about the role of women in the modern world, she taught, and she spent time with children and young women. She was, in short, a very remarkable woman. 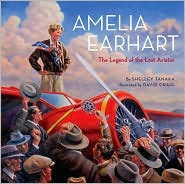 For Amelia's birthday anniversary (July 24th) I reviewed an excellent book called Amelia Earhart: The Legend of the Lost Aviator by Shelley Tanaka and illustrated by David Craig. Shelley Tanaka has written many splendid non-fiction titles and this is one of her best. Here is my review of the book. Amelia Earhart was not the kind of person to be put off when people told her that what she wanted to do was impossible, or inappropriate, or unladylike. More than almost anything Amelia believed that people should pursue their dreams. If need be, they should fight to do what they believe is important. Amelia certainly did; she ended up doing what she cared about the most: flying, teaching, and helping others. Once Amelia found her place in the sky, she was unstoppable. She broke records and proved to the world that women can be great pilots, just like men. Flying rickety planes that were notoriously prone to breakages and problems, Amelia traveled long distances not only to break records, but to show women that the sky is indeed the limit. When Amelia’s plane disappeared in July 1937, the whole world watched, waited, and then grieved. To this day, we do not know what happened to Amelia Earhart. We may never know, but her legacy lives on, and generations of girls and women still look to her for inspiration. In this marvelous picture book Shelley Tanaka brings Amelia Earhart’s world to life. With numerous quotes from Amelia’s writings and speeches, the book beautifully captures Amelia Earhart’s indomitable spirit and her sense of adventure. Packed with information, illustrations, and photographs, this title is a must for all young Amelia Earhart fans. If you are interested in purchasing this title please consider doing so through The TTLG website to help support this blog. Many thanks. Labels: Amelia Earhart, Review, Shelley Tanaka. 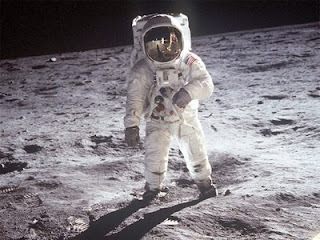 Forty years ago today, human beings walked on the moon for the first time. As millions of people watched, Neil Armstrong and Buzz Aldrin landed on the moon and took those first incredible steps. In honor of this anniversary, many publishers have put out new books for children about this extraordinary event. I have been lucky enough to review some of these books over the last few weeks, and now you can see my reviews on the Through the Looking Glass Book Review website in the Man goes to the Moon feature. There are some wonderful titles in this collection, and I hope you find a title or two that you would like add to your library. 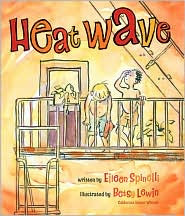 Earlier this week I reviewed Heatwave, a picture book by Eileen Spinelli. As I enjoyed the book so much, I decided to interview the author. My sister Tina and I were talking one day about "when we were young"--and how we grew up without air conditioning. That led to other memories--like our Aunt Rosewho used to keep her perfume in the refirgerator. I decided it might be fun for kids to hear about those times when one had to be rather creative about keeping cool. The story takes place over a number of days, with the temperature rising all the time. Why did you decide to pace the story in this way? Every story needs an arc. This story didn't have a big plot as such...so the rising temperature seemed a good way to build "suspense". In this story, the text is packed with images that are wonderfully vivid. Are these images ones that you have seen, heard, and felt? Directly from my childhood. They were real. Recently I experienced a short heat wave here in Oregon and it was interesting to see how people donned hats, paddled in the river, sought out shade, and walked slowly to deal with the heat. It just goes to show that we can still be affected by the weather. Do you think some of us are too cut off from the seasonal changes that unfold outside our homes? How do you and your family enjoy the summer months? We spend much of the summer at Chatuauqua Institution in New York State ...where there is a lake...and where most of the events and activities take place in the outdoor amphitheater and other open air venues. We eat meals on our balcony. We walk everywhere--no cars allowed! Children play ball and violins in the square. Adults eat ice cream cones. It's got an old fashioned feel to it in the best sense. Have you considered writing a book about a winter storm? I have a book coming out giving equal time to winter! Thank you very much Eileen. 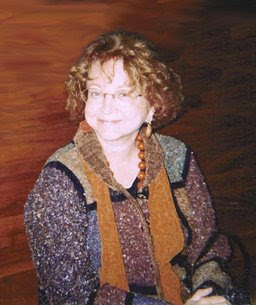 You can find out more about Eileen and her books on her website. We have had some very hot days here in Ashland this summer. The Fourth of July was blistering, and during the day I frequently found myself seeking out shade, spraying myself with water, sticking my feet in the river, and drinking cold water. These singularly low tech cooling off methods reminded me of a book that I read and reviewed recently. The book, Heatwave, describes what takes place in a town during a very hot summer week. The story is set in a time when people did not have air conditioning units in the homes and offices. They have to find other ways to get survive the hot days and night. Lumberville is in the grip of a heat wave. There are no air conditioners, so everyone in town swelters in the heat. On Monday, the move theatre closes and Abigail and Ralphie Blue set up a lemonade stand. Tuesday is even hotter, and some of the residents in the town resort to taking long cool baths and showers. By the time Thursday rolls around it is so hot that Mr.Blue shaves off his beard, and the Pettibone sisters put their perfume and makeup in their icebox. How much hotter can it get? In this delightful picture book, Eileen Spinelli perfectly captures what it was like to live in a time when there were no air conditioners, when people had to find all kinds of creative ways to stay cool. She shows her readers how the heat unifies the people in Lumberville; it brings them together as they all try to find some relief from the heat. Throughout the book, Betsy Lewin’s illustrations beautifully compliment the narrative. In particular, she brings the humorous touches in the story to life. If you have creative ways to keep cool please tell us about them. When many children think of summer, they think of vacations, eating ice cream, sleeping late, and summer camp. My daughter is going to a wide variety of day summer camps this summer, and so far she has had a great time. 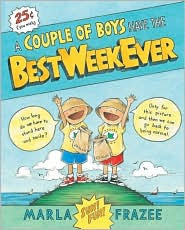 Last year I reviewed a delightful picture book that is about the adventures two boys have during a week long summer getaway. James and Eamon are going to have a week of nature camp together. They are going to stay at James’ grandparents’ house at the beach. James is pretty excited because he has never been away from home for a whole week before. Their first day at nature camp isn’t that exciting but the time that the boys spend together afterwards at the house is great. The food that Pam (James’ grandmother) makes is wonderful and Bill (James’ grandfather) is a good sport even if he does go on about Antarctica and penguins rather a lot. With each passing day the boys get closer. They don’t really get that much out of nature camp but they have a terrific time playing games, watching T.V. and not spending any time on the beach. In this delightful summer title Marla Frazee truly captures with great skill and humor the essence of little boy doings. Anyone who has ever spent any amount of time with little boys will recognize the behaviors and thinking processes of these two children. Parents will see how fruitless it is to try to steer little boys into a certain direction, and children will laugh to see how much fun James and Eamon have in spite of their nature camp activities. The wonderful illustrations in the book compliment the text perfectly, catching the nuances of little boy shenanigans and games. Don’t forget to look at the ‘photo gallery’ inside the front and back covers of the book. The book was a Caldecott Honor book for 2009. You can find out more about the author and her books on her website. Last week I had a very special visitor, my pen pal of thirty years came to stay with me here in Oregon. Ute and I began writing to each other in 1980 when we ten and eleven years old. She lived in Germany, and her parents wanted her to improve her English. A mutual friend introduced us, and soon letters were flying between the the two of us. A few years after our correspondence began, I went to visit Ute in Germany. The next summer she came to visit me on the island of Cyprus. We helped each other through our college years, and when Ute became a doctor I was incredibly proud. When she arrived on my doorstep last Wednesday, I was thrilled to see my tall, blond friend again. This time she brought her boyfriend Oliver with her, and I soon grew to like him a great deal. She also brought a small fluffy friend in her suitcase for me. Some years ago I discovered the Felix books. In these delightful stories, a stuffed toy rabbit goes on wonderful adventures, and he writes letters to his little girl to tell her what he is up to. The books are enormously popular in Europe and I have reviewed all of them for Through the Looking Glass Book Review. I was delighted to recieve my own personal Felix, and he will join Dogmatix, Olivia, and the numerous stuffed dragons who live in my office. I hope you get the opportunity to read at least one of the Felix books. You can read my reviews of these charming books here, and I know you can buy them in bookstores and online. As a follow up to my last blog entry, I have a review for you of In 1776. This splendid book uses very simple yet rich language to tell the story of what took place in America in 1776. Children who want to better understand what the Fourth of July is all about will find that this title will answer many of their questions. In 1775 America was under British rule. It was an uneasy time because the colonists were angry that “they had no say” in their own government. The king of England insisted that the colonists had to pay more taxes and the colonist said “No!” Some even went so far as to say, “It’s time for you to go.” And so, in Lexington and Concord, fighting broke out between the English and the colonists. Then in 1776, the colonists decided that they needed to make their position clear. Their leaders met in Philadelphia to discuss the problem. A committee of men then worked together to write a document that would clarify what the colonists wanted. This document came to called the Declaration of Independence. 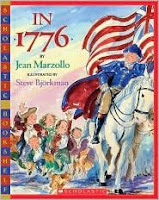 In this excellent title, Jean Marzallo uses rhyming stanzas to help children understand what took place in 1776. They will come to appreciate why and how the events that took place at that time still have an impact on us today. An excellent introduction discusses the fact that the “struggle” for democracy is ongoing, and it is something that we can all work for.